My photography skills may be improving! Macarons, a popular french petit-four, is elegant, beautiful, and can even be tasty- a difficult combination to come by. The dessert is made with whipped egg whites, ground almonds, powdered sugar, and a flavorful filling, and though divine, they are the most frustrating, temper-rising, eye-watering and nastiest dessert to make. The almonds have to be skinless, and ground up to the finest of crumbs that may resemble ground coffee, the eggs have to be beaten to the perfect peak, and the batter must be stirred no more than 50 times. Once piped, the batter must dry for a good half hour before baking, other wise that pretty, frilly foot at the bottom of the cookie won’t appear. They have to be baked for just the right amount of time – over baking makes the cookie too crunchy, and under baking causes the top of the cookie to sink, creating a dense Macaron. If the batter is too thin, the cookie will spread and well, it’s ruined. Being the perfectionist that I am, I have continued and continued to make macarons until I get the desired result. I have made these cookies roughly 20 times, three of which, I was satisfied. Over these tries, I learned that in order for the macaron to dry, you can only make these if your house is dry- meaning wintertime, when central heating is turned on, or summertime, when air-conditioning cools your house. It is also far easier if you’ve bought the almond meal instead of making it yourself. Why go through all that trouble? 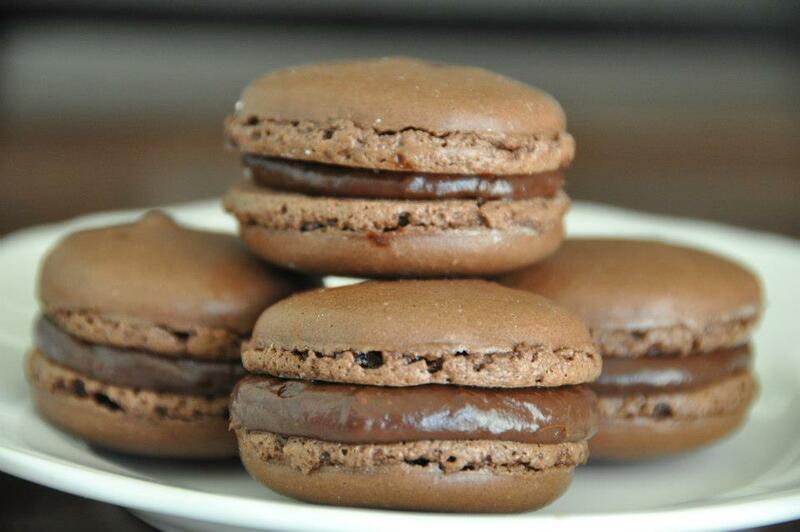 Here is a fool-proof recipe for macarons with incredible results, I’ve adapted it from allrecipes.com. Make sure you are weighing your ingredients, even the egg whites. 100 g egg whites (approximately the whites of 3 large eggs) – no trace of yolk, otherwise it won’t whip properly! In a food processor, combine the confectioners’ sugar, ground almonds, and cocoa powder. Pulse for a minute on high, until well combined and fine. In a clean, glass bowl, place the egg whites, and beat until you get nice, stiff peaks- they’re there when you hold the bowl upside down (on top of your head) and the whites don’t move or fall… should take 5 minutes with an electric mixer. Gradually add in the granulated sugar, until the whites are glossy. Set the beaters aside, and using a strainer, sift in the sugar, cocoa, almond mixture. Using a spatula, fold this mixture in- should take about 40 strokes. Bake for 20 minutes in a 140 degree Celcius oven. Boil 100 g of heavy cream, add to 100 g dark chocolate. Add 1/2 cups of ground up frozen raspberries, and enjoy! They look great! I actually blogged about my first macaron attempt yesterday. Might try this recipe out!